Knight and Day, a romance-spy thriller directed by James Mangold, could easily be called Charade with Modern Gadgets. Or maybe just Cruise and Diaz like the promotional poster tells us. Tom Cruise and Cameron Diaz, who reunite on screen for the first time since 2001’s Vanilla Sky, are far bigger than the movie itself. How these star personas play out in the film, however, are two completely different stories. Diaz is June, a woman who owns a garage in Boston and doesn’t have much excitement in her life. On her way from Wichita (another unsuccessful title for this film) to Boston, she unintentionally crosses paths with Roy Miller, a special agent who has gone rogue. Miller and his ex-partner Fitzgerald (Peter Sarsgaard) are duking it out over a never-ending battery that takes the character’s on an international chase. Roy and June venture everywhere – New York City, a deserted island, Salzburg, Spain – trying to allude the bad guys (whoever they may be) and save the battery’s inventor (Paul Dano) from the feds and some Spanish arms dealers. 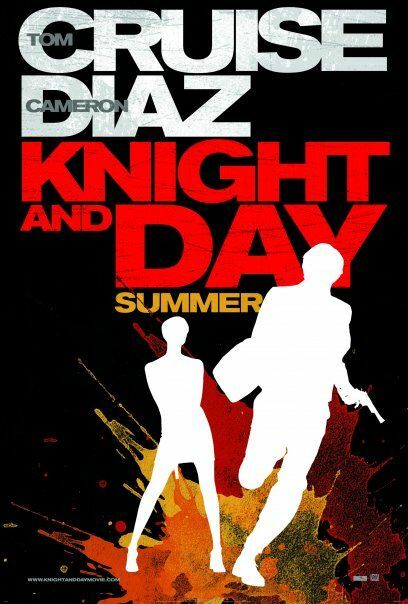 As a romance-action-spy thriller, Knight and Day is filled with twists and turns. We never really know who is good, who is evil, or if Roy is just plain nuts. And June? She is the everywoman foil to Roy’s super spy. She is, at first, an unwilling participant in the mayhem who mostly screams, is frequently drugged and unconscious, or gawks at Roy for the entire film. But as appealing, charming, and irritating as Diaz is in Knight and Day, she is no match for Cruise and his star persona. Overall, Knight and Day is a fun summer movie. With Eclipse-mania knocking at our doors, sometimes that is just need what you need. Next Next post: These are the unforgettable movie songs?